Coffee has become such an essential part of our everyday life; it wakes us up in the morning, keeps us awake during those drowsy afternoons, and allows college students to stay up all night studying during finals week. Whether it’s a fancy latte made from a hipster barista or a crappy cup of Joe that we force down anyway, coffee is an extremely valuable commodity. Even myself, I admit to sipping on my third cup of coffee for the day as I write this (for inspiration, of course). 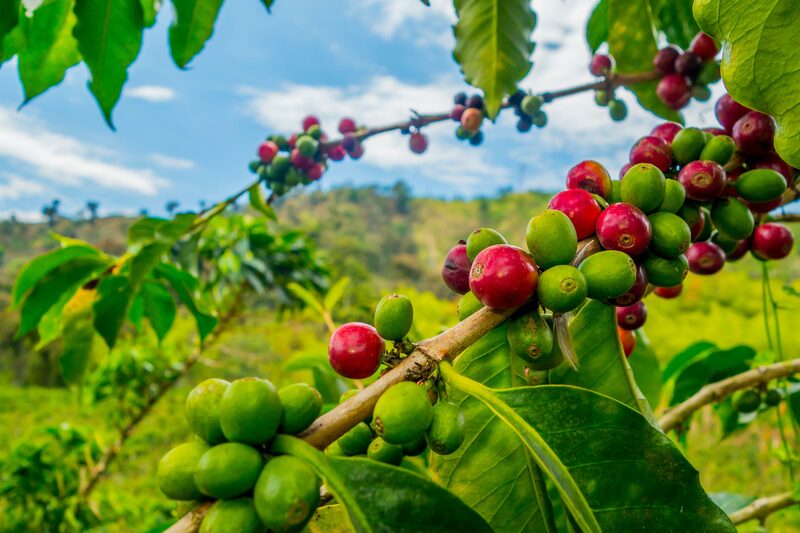 Although we idolize this essential beverage, most of us do not know much about the long process it takes for coffee to get from the ground to our cups. Taking a deeper look at the growing process, it’s clear that a lot of hard work, and probably many cups of coffee, go into the first step of making this decadent, liquid pick me up. Although we are highly dependent on coffee in North America, coffee trees depend on warm climates, and therefore only grow in the region between the Tropics of Cancer and Capricorn. This area, also known as the Bean Belt, includes countries in Central and South America, the Caribbean, and Africa, which is a pretty far distance for those little beans to travel! The coffee tree is a type of tropical evergreen, and is typically grown in mountainous areas with lots of rainfall. They can grow up to 30 feet high, although they are usually kept smaller to make harvesting easier as this step is generally done by hand. Coffee trees are constantly growing and producing, and one tiny tree can produce enough beans for up to 1.5 pounds of coffee. There are two main types of coffee trees, Arabica and Robusta. Arabica (Coffea arabica) is descended from the original Ethiopian coffee trees, and makes up about 70% of the world’s coffee production. Robusta (Coffea canephora) was not discovered until more than one hundred years after Arabica was discovered. Therefore, Robusta only makes up the remaining 30%. It is mainly grown in Brazil and Southeast Asia on flat lands as opposed to the high altitudes usually required for Arabica trees. Robusta trees are smaller shrub–like trees, and their beans are smaller and rounder than Arabica beans. They also have about 50% more caffeine than Arabica, but also produce a more bitter taste. While Arabica is believed to be the superior blend with a smoother taste, Robusta is actually used in some blends of Italian espresso to give it a bolder flavor. So, how do these trees turn into your morning cup of coffee? At first, the trees produce very fragrant white blossoms that then mature into coffee cherries, which actually look like little red cherries. 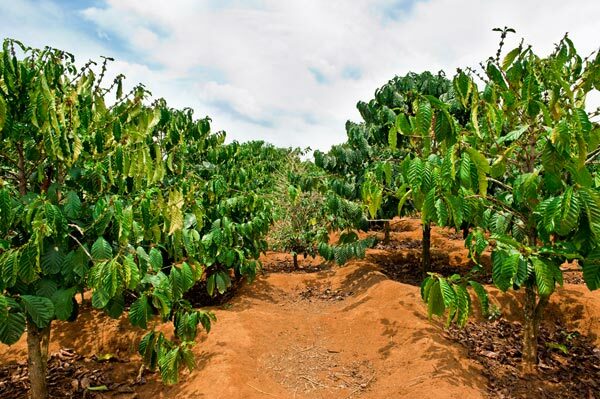 These cherries usually take 7 to 9 months to ripen for the Arabica tree, and about 11 months for the Robusta tree. The coffee cherries are then harvested, usually by hand, but Robusta cherries are easier to harvest and can therefore be collected by machines as well. Inside these coffee cherries are coffee seeds, which are the whole coffee beans we are used to seeing before they are roasted. When they are first removed from the cherries, however, they are green instead of the rich brown we associate with coffee beans. The coffee seeds are then roasted, grinded, and brewed to produce the steaming hot cup of coffee we all know and love. Worldwide, we consume about 2.25 billion cups of coffee daily. Despite this enormous amount of coffee present in our daily lives, most people are completely unaware of the whole process coffee has to go through to get into our cups. So next time you’re enjoying a hot cup of Joe, think about and appreciate exactly how much work goes into making that coffee. It might just make it taste even better.